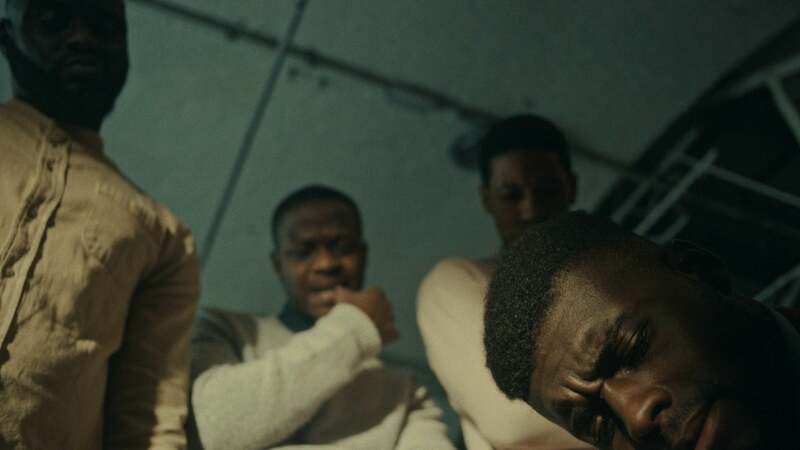 When it came to short film at this year’s London Film Festival – the programmers really nailed it. Featuring a diverse selection of stories that made me laugh, cry, question and scream (only internally), the selection of challenging and entertaining films left me feeling so positive about the short film format. 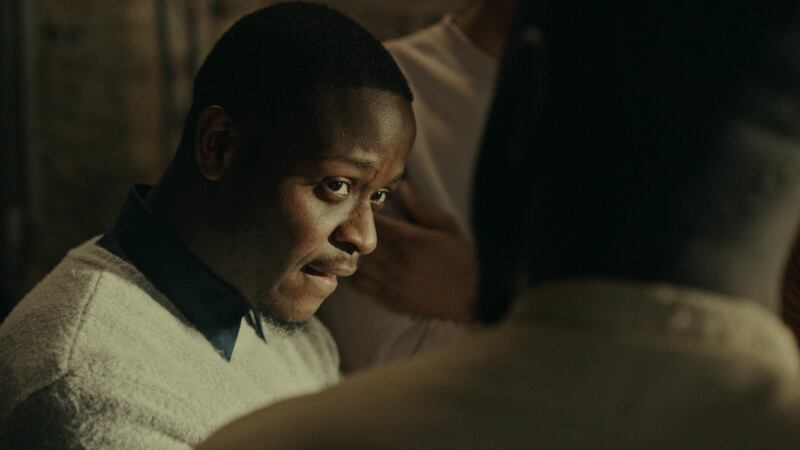 Key contributor to the laughter category, was Runyararo Mapfumo’s Masterpiece – a charming comedy about a group of young men trying to interpret their friend’s art so they can save face and show support. Still smiling from the screening, I caught up Writer/Director Mapfumo to discuss forming bonds between actors and making a ‘layered’ film. Can you tell us a little about where this story came from and why you wanted to tell it? I’ve been told time and time again to “write what you want to see”. I started thinking about what that meant to me in a everyday context. These characters are black men that I recognise, I can see elements of their personality, their way of speaking, their jokes, their opinions, their essence, in my friends, family and my community. I can’t say that I see that in many TV shows and films. The film is a combination of conversations I’ve overheard (or had myself!) in gallery spaces. I wanted to touch on some of the themes I had been playing with, including representation, in a comedic way. It was incredibly exciting to be able to tell a story that explored ‘Black Boy Joy’ and what that can look like. On the surface, Masterpiece feels like quite a simple idea but there are some interesting themes bubbling away in it (poverty, food banks) – you could almost say it’s ‘layered’ – how much was the film just a story of camaraderie or was there a broader message you wanted to get across? Haha, layered, I like that! Overall, I see this film as a celebration of brotherhood, while not neglecting the nuances of the everyday experiences lived by black people. The comedy works to challenge and discuss socio-political themes within a context in which we experience those issues on a day to day basis. I felt that the most important thing about the film was the relationships between the guys. Simbai is the artist and the other four guys are his friends, purely finding themselves in the art world to support their ‘brother’. Through their interpretation of the art we get a sense of who they are and their world view. I didn’t want the conflict to revolve around their identity but rather through their observations. The comedy works to challenge and discuss socio-political themes within a context in which we experience those issues on a day to day basis. I wanted the audience to leave feeling entertained but also feeling like the film said a lot without overtly saying anything. Every now and again you watch a film or read a book and you finish thinking ‘it encapsulated my experience’ – generally I find that is the case when engaging in material that is authentic rather than overly intellectualised. One of the things I love about the film is how real the connection between this group of young men feels, how did you work with the actors to get the feeling of brotherhood between them? Once I wrote the script I knew that the chemistry between the actors had to be strong. I approached Kharmel Cochrane Casting with my script and directors notes; they immediately understood what I wanted to do. It was such an amazing experience working with them. Joelle Cochrane and I worked hard to select the actors that already felt similar to their characters. The natural banter between the actors felt really similar to the scripted jokes, so I just tried to keep their energy up throughout the day. Once I had selected the actors, my Producer, Grace Bridger, and I met up with the guys, went to watch a movie and just hung out. Over the next fews weeks, I encouraged them to talk everyday and it was amazing to see how quickly they bonded. The atmosphere was great once we got onset. The natural banter between the actors felt really similar to the scripted jokes, so I just tried to keep their energy up throughout the day. Though the comedy in the film is bound to be its biggest draw Masterpiece is also a great looking short (I also love the soundtrack), what can you tell us about how you approached the aesthetic and pace of the film? Thank you! I really enjoyed creating the look of the film. I had a lot of visual references when I started working with my DoP, Ev. 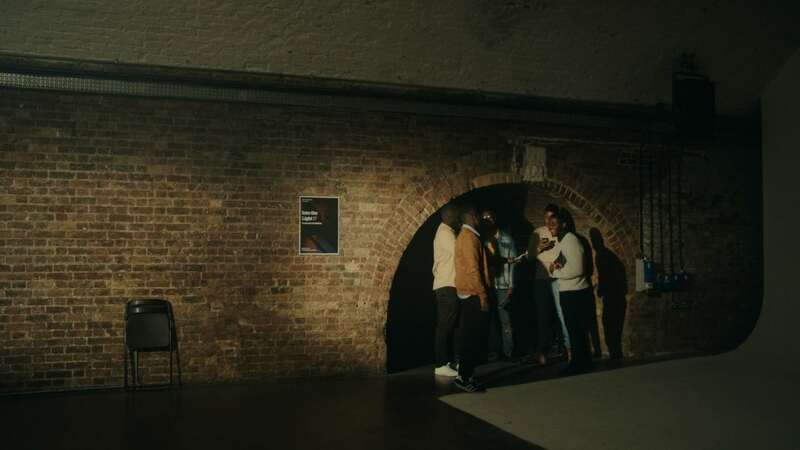 I was really interested in the aesthetic of a group of black men in an under lit space, and how that image has been used tirelessly with negative connotations. In nearly every frame, there is at least two of the boys on screen, I wanted to play around with them being physically dominant. This aesthetic could have been taken down a very predictable narrative, by the standards we’re used to in a lot of film and TV shows, but I wanted to spin that on its head. The music was created by brilliant Composer, Jack Newton, who I was introduced to through my Editor Mdhamiri Nkemi. We played around with a couple of ideas but we knew that a percussive soundtrack would be most appropriate for not only the characters but also the comedy beats, e.g. the drumroll. Fortunately, he’s a drummer, so I think he really enjoyed writing the music to it. Why did you decide to end the film in the manner that you did, was it important the focus wasn’t on the meaning of the art? In some ways, the art did what it was meant to – start a discussion. We observe the boys interpreting the art, which also presented an opportunity to get a better understanding of their group dynamic, friendship and their class and race perspective. I also liked the idea of putting a question mark above art. What makes something a piece of art? I know what the art means to me, but I haven’t shared that with anyone. Each of the actors had their own interpretation of it too and it’s up to the audience to dissect it for themselves. I also liked the idea of putting a question mark above art. What makes something a piece of art? What’s the difference between the first and second piece? Masterpiece was BFI NETWORK’s pick of the month, so they will be working with us to develop our next project. This is still in really early stages but I’m really excited to work with the BFI NETWORK team. They’re really supportive of new and emerging filmmakers in the UK and are really on board with what we’re making next.